As mail comes in throughout the day, do you read one here and another there? Do you leave a few for later, read some again, save the newsletter for after lunch, save the same newsletter again for tomorrow, and eventually, end up with an Outlook Express Inbox that is mostly read mail (at which you may or may not look again later) sprinkled with a few new messages here and there? Would it not be nice and useful if you could, for a while, hide all messages you have already seen and concentrate on the unread emails? Select View > Current View > Hide Read Messages from the menu. Select View > Current View > Show All Messages from the menu. Select View > Layout from the menu. Make sure Views Bar is checked. In order to get to the mail you need most even faster, you can also change the sort order, of course (and add a column for sorting maybe), and group emails by subject. 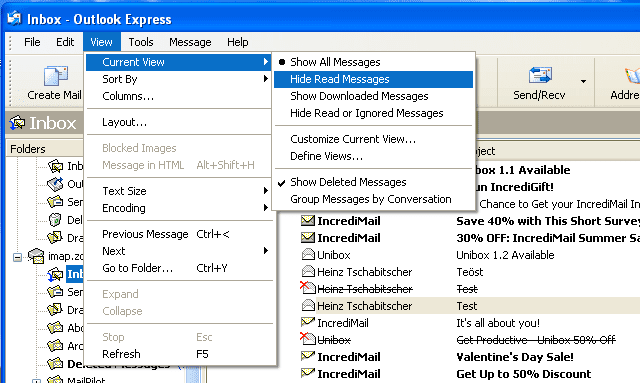 These are all tools for making your inbox tidier.